The road layout was changed around 1955 to its present formation. 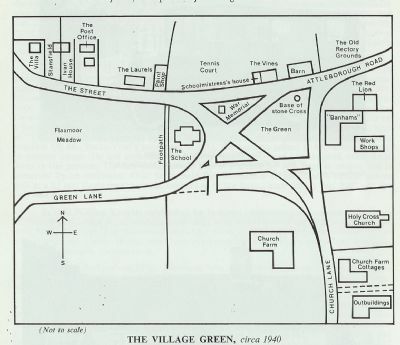 It is interesting to note that the village had its own village constable from as far back as 1851 but The Villa (top left), built 1912, was acquired in the 1920's and housed the village bobby from then until 1936 when a new police house was built at Stow Bedon. The Laurels was home to the village bus (see photo in the gallery) which was garaged here. 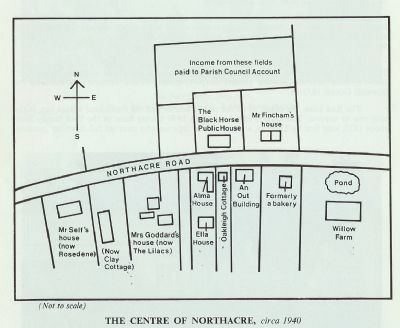 Northacre's only shop was that belonging to Mr Self. A charming story is told of how a child, buying an ounce of sweets, would, if the packet was slightly overweight, wait patiently while Mr Self sucked one sweet down to the precise weight. The premises closed in 1927. 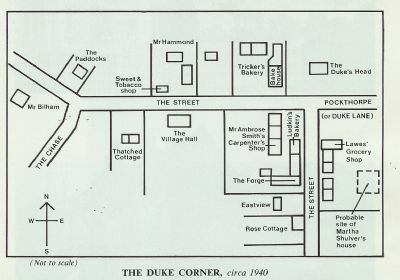 In the mid nineteenth century there was a school either in the house immediately east of Mr Self's house or more likely in what is now shown above as The Lilacs.